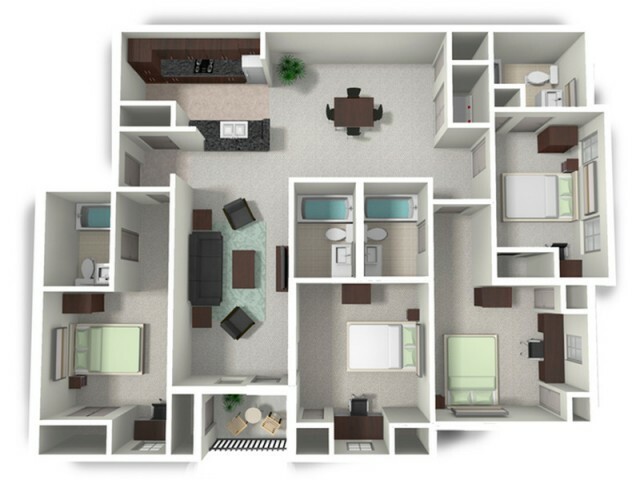 Our 4X4 floor plan comes with absolutely everything included-- cable, utilities, internet, stainless steal appliances, amd furmiture are all included within your rate. Valid Through : Jan 01, 2017 - Jan 07, 2035 There is an Additional $100 short term fee per month it the lease ends before 7/31. Valid From : Apr 05, 2018 For a limited time application fee is reduced to $7! Valid From : Apr 17, 2018 Limited time offer! Sign a lease within 24 hours of touring or starting your application online and get your application fee waived! All pets must be registered with the office. There is a $300 nonrefundable pet fee as well as a $25 monthly pet rent. Weight and breed restrictions apply. Please contact our office for additional information.